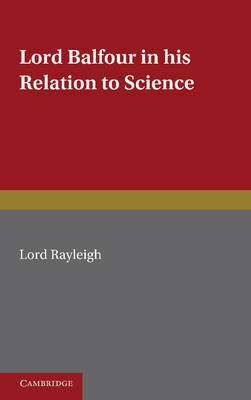 Originally published in 1930, this book provides a memoir of former Conservative Prime Minister Lord Balfour's relationship to scientific thought. The text was initially created as an obituary for the Proceedings of the Royal Society but, due to the prominence of its subject, was reprinted for a broader readership in this Cambridge version. An account is given of Balfour's early history and mental development, his scientific and philosophical thought, and his administrative work for scientific, industrial and medical research. This concise volume will be of value to anyone with an interest in Balfour and the history of science.